The route will take you east from Kinlochewe near beautiful Loch Maree to the wide canvass of Achnasheen and its surrounding hills. From there you head south on a fine new road down through Glen Carron to the sea at picturesque Lochcarron. 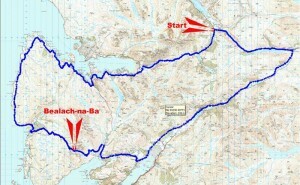 Things get tough now as the road swings sharply upward for the main climb to Bealach-na-Ba. The section of road from Tornapress up the Bealach and down to Applecross campsite is closed for the event. The reward is great as a massive vista over the west coast and the Isle of Skye opens before you as you plunge down to sea level again at Applecross. The hard work is not over as the next section around the north of the peninsula has hardly any flat as it clings to the coast, past rocky cliffs and sandy coves. Finally you pass the charming village of Sheildaig nestling in the shelter of its loch and the final section begins. Weary legs will be revived through rugged Glen Torridon overshadowed by the massive craggy bulk of Liatach and its sisters on the famous ridge. Finally, relief is at hand with a gentle descent back to the finish at Kinlochewe.